Journal of the House of Lords: Volume 11, 1660-1666. Originally published by His Majesty's Stationery Office, London, 1767-1830. DIE Lunæ, videlicet, 14 die Maii. Ld. Stanhope, concerning the Post Office. Baynes sent for, for Words against the King. Millot's Petition about his Ship. Chamberlain, Earl of Denbigh's Servant, Privilege. Watkins to be restored to the Searcher's Place of London. Bushell to attend the Committee for Petitions. Message to H. C. for Committees to meet about the King's Reception. Grove, &c. concerning New College. Serjeants at Mace, to deliver Maces. Wethered restored to the Comptrollership of the King's Works. Exportation of the King's Goods to be prevented. Bill for settling the Nation. Lords to be wrote to, to attend. 22 Viscount Say & Seale. 16 Comes Monmouth. 4 Ds. Willoughby of Parham. 12 Ds. Howard of Esc. 1 Ds. De la Warr. 13 Ds. Herbert of Cherbury. 4 Comes Exon. 7 Comes Rivers. Any Five; to meet at 9 To-morrow Morning. It is ORDERED, That the said Baynes shall be sent for, as a Delinquent, to be brought before this House To-morrow Morning; and then the Witness likewise to be present. And upon Information by the Earl of Lyncolne, "That there was another Person that had spoken other treasonable Words against the King:"
It is ORDERED, That he be sent for, as a Delinquent, when his Name shall be given in; and likewise the Persons that are Witnesses. It is ORDERED, That his Ship shall be delivered to him, unless Cause be shewed to the contrary within Seven Days. Two Petitions of Baron Tomlins were read, and ORDERED to be referred to the Committee for Petitions; and they to have Power to examine the Contents thereof, and report the same to this House. John Segrave, John Dowell, and Jo. Osborne, were brought to this Bar, as Delinquents, for arresting Mr. Chamberlaine, a menial Servant to the Earl of Denbigh, who had his Lordship's Protection under his Hand and Seal. Jo. Dowell and Jo. Osborne said, "They did arrest the said Chamberlaine, and did see his Lordship's Protection when it was shewed them; but they could not read, therefore carried the same to the Secondary of The Counter." It is ORDERED, That the said Dowell and Osborne shall be committed to The Fleete, during the Pleasure of this House; and that the Secondary of The Counter shall be sent to, to appear before this House To-morrow Morning, to answer his Offence. And upon the Mediation of the Earl of Denbigh; it is ORDERED, That the said Jo. Seagrave, the Creditor, shall be released, in regard he is a poor Man. That they will send an Answer by Messengers of their own. Upon reading the Petition of Edward Watkins, Head Searcher of London; desiring, "he may be restored to the said Office, having a Patent for it from the late King, and being unjustly put out:"
It is ORDERED, That he be restored to the said Office; according to the Petition. ORDERED, That the Keeper of the Prison where Tho. Bushell is a Prisoner shall bring him before the Lords Committees for Petitions To-morrow in the Afternoon, at which Time his Cause is to be heard there. 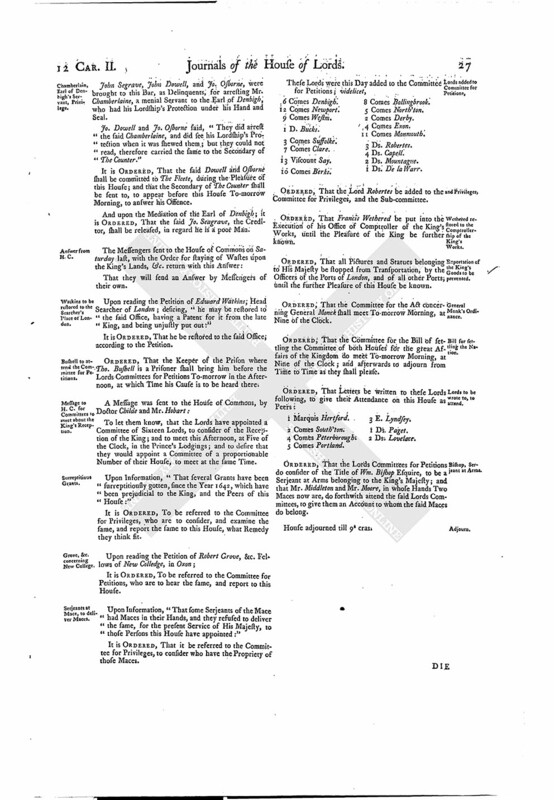 To let them know, that the Lords have appointed a Committee of Sixteen Lords, to consider of the Reception of the King; and to meet this Afternoon, at Five of the Clock, in the Prince's Lodgings; and to desire that they would appoint a Committee of a proportionable Number of their House, to meet at the same Time. 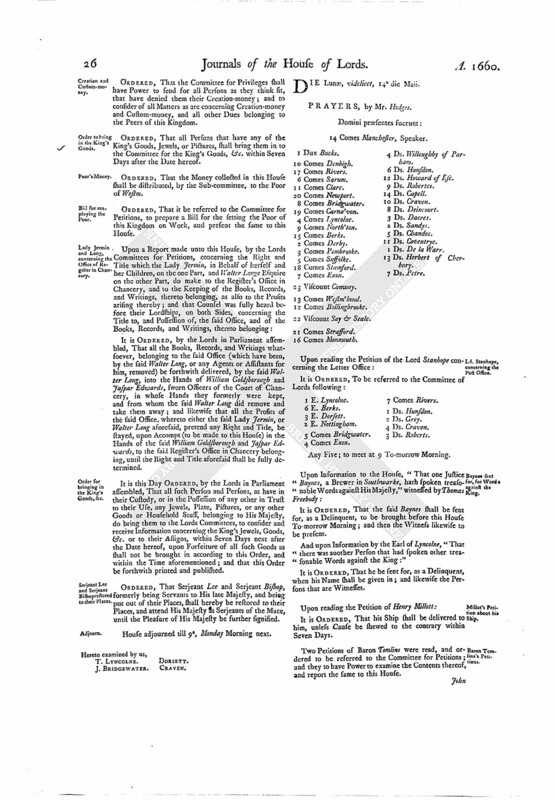 Upon Information, "That several Grants have been surreptitiously gotten, since the Year 1642, which have been prejudicial to the King, and the Peers of this House:"
It is ORDERED, To be referred to the Committee for Privileges, who are to consider, and examine the same, and report the same to this House, what Remedy they think fit. It is ORDERED, To be referred to the Committee for Petitions, who are to hear the same, and report to this House. Upon Information, "That some Serjeants of the Mace had Maces in their Hands, and they refused to deliver the same, for the present Service of His Majesty, to those Persons this House have appointed:"
It is ORDERED, That it be referred to the Committee for Privileges, to consider who have the Propriety of those Maces. 10 Comes Berks. 8 Comes Bollingbrook. ORDERED, That the Lord Robertes be added to the Committee for Privileges, and the Sub-committee. ORDERED, That Francis Wethered be put into the Execution of his Office of Comptroller of the King's Works, until the Pleasure of the King be further known. ORDERED, That all Pictures and Statues belonging to His Majesty be stopped from Transportation, by the Officers of the Ports of London, and of all other Ports; until the further Pleasure of this House be known. ORDERED, That the Committee for the Act concerning General Monck shall meet To-morrow Morning, at Nine of the Clock. ORDERED, That the Committee for the Bill of settling the Committee of both Houses for the great Affairs of the Kingdom do meet To-morrow Morning, at Nine of the Clock; and afterwards to adjourn from Time to Time as they shall please. 5 Comes Portland. 3 E. Lyndsey. ORDERED, That the Lords Committees for Petitions do consider of the Title of Wm. Bishop Esquire, to be a Serjeant at Arms belonging to the King's Majesty; and that Mr. Middleton and Mr. Moore, in whose Hands Two Maces now are, do forthwith attend the said Lords Committees, to give them an Account to whom the said Maces do belong. House adjourned till 9a cras.